Not to be confused with Sheri. 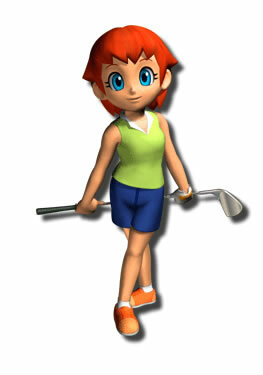 Sherry is a red-haired young female golfer in Mario Golf for the Game Boy Color, who returns in Mario Golf: Advance Tour. According to the Mario Golf: Advance Tour instruction booklet, her mother encouraged her to begin golfing when she was very young. She is also twelve years old in Mario Golf, just two years older than Kid. In fact, Sherry is one of the kids responsible for leaving golf balls scattered around the northern part of the Mario Golf's Tiny-Tots course. In Mario Golf, she is one of four characters that can be chosen from at the beginning of the game and train however the player like. She can also be uploaded to the N64 version for more training. In Mario Golf: Advance Tour, Sherry is the champ of the Palms Singles Cup, and the champ of the Palms Doubles Cup as well, with her partner and former Palms Champ Grace. In Mario Golf, Sherry is a young girl with fiery-orange hair tied back into two pigtails with blue hairties, and bright blue eyes. She wears a yellow vest with two green buttons over a white-polo shirt, and blue shorts. In the game she wears a yellow golfing glove. She wears short white socks and orange golfing shoes. In Mario Golf: Advance Tour, Sherry has grown to become a young woman. Her hair has been let down and cut short, now with bangs. She wears a bright green sleeveless shirt with a white collar, and tight blue shorts. Her golfing shoes are still orange, and her golfing glove is the trademark white, only with a hint of gold (similar to Helen's). She seems to have gained a tan as well. My first encounter with golf was by watching others and my mama. Adults around me say "Her putter is amazing, genius," but it's not that good. Still needs work. My mama is getting better, which means I need to get better, too. I've been told my pigtails add to my charm. Look! Look! Aren't they cute? This page was last edited on January 31, 2019, at 21:57.